The design of investment castings is eventually successful on the basis of the communication between the designer and foundry engineers. When part requirements are clearly stated by designers, there is usually a compromise of specifications that will allow for maximum compliance to print specifications and finish part design. 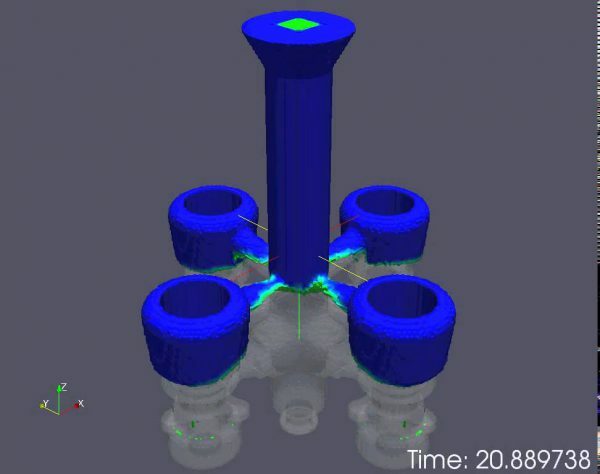 When designing a casting it’s important to consider the tolerancing capabilities (both dimensional and geometric) of the investment casting process being used as well as any draft and required minimum radii and fillets. When undertaking an investment casting design, the designer has to limit the shrinkage defects that can form in the casting. A gating and risering system is used to fill the part with molten metal and control the defect level in the finished casting. Although, as you will see in this section, the casting design will determine the amount of feed metal needed in order to maintain a specified defect quality level. Good detailed prints are an absolute necessity in designing castings. The print is the most accuract description that what the designer requires in the final product. A complete drawing designed for investment castings should include information about the casting geometry (size, shape, draft, radii, etc..). In addition, it should also contain the acceptable tolerance level, defect level, and surface finish. As well as any inspection requirements, radiography, magnetic particle inspection, destructive testing. Material need to be marked on the print with material grade or possibly the mechanical properties of the material. Geometric dimensioning and tolerancing may also come into play on a casting design. interference, the lettering can be cast in a recessed pad. A machined investment casting will have dimensions for the machined features as well as dimensions relating the machined features to the cast features. The machining print may include a note on corner breaks required, surface finish callouts for the machined surfaces, geometric tolerances, etc. Foundries typically prefer two drawings, one for the casting and one for the finished machined part. The casting print will include the amount of finished stock required. 3mm or 0.125‖ of machine stock is typical. When geometric tolerancing is used on a casting print or machined casting print, it is always good practice to establish datum points at specific locations on a cast surface for the various datum planes. With the surface inconsistencies, this practice allows consistent inspection and layout at the foundry, machinist, outside inspection lab and customer. All tooling can be built to reference these datum points and it will go a long way to help with any dimensional issues that may come up with a machined casting. Above are the main tips on the design of investment castings, if you are not familar on this field or would like to convert weldment to investment casting, our foundry engineer can help you to finish this job with sample provided.